The yacht has two triple cabins; four double cabins; and four Twin cabins with Pullman beds for a total of 20 people. Each has private bathroom with shower. 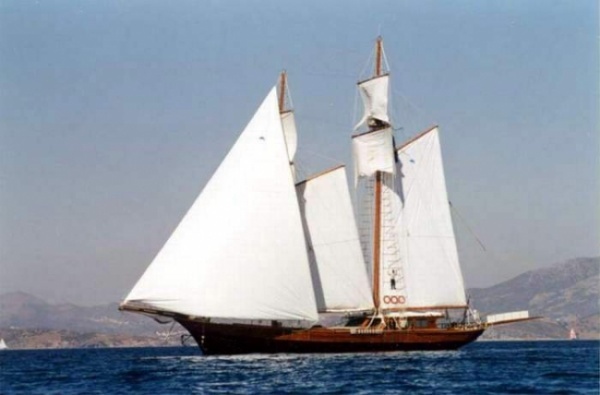 MATINA is a 125’ schooner available from Athens, Greece from May through October. It sleeps 20 guests in 8 staterooms and is one of the few yachts “legal” to charter with more than 12 guests. When we inspected her in Greece in May, 2017, she had just finished a large refit including new air conditioning, new tender, new generator. New decks were installed in 2016. She has an aft cockpit with sunbeds and a long dining table that seats 20, and there is another dining table in the saloon. She has 18 sunbeds on the coach roof. The high bulwarks are safe for children. The two coffee tables in the traditionally appointed main saloon expand and connect to seat 20 people. There is a bar there as well. A second entertainment area is up on the fly bridge, great for sunbathing and watching the sun go down. The 8 staterooms are off a long central corridor leading forward from the saloon. Mirror images of each other, two are doubles with an additional lower single bed on the opposite side of the cabin; two have lower side by side twin beds; two more have upper and lower bunk beds, and the 7th and 8th cabins have lower twin beds and each has an upper foldaway Pullman berth. All have their own bathroom, and each is fully air conditioned and each has electric flushing heads. (The yacht has two triple cabins; four double cabins; and four Twin cabins with Pullman beds for a total of 20 people.) The yacht is ideal for three families or multi-generational families. Theo is the captain and he is assisted by five to six crew, offering lots of water toys. Theo allows guests to choose the itinerary and the crew will suggest places as well. Everyone usually wants to go to Santorini, but there are other beautiful islands as well. The yacht has a BBQ, and the crew usually do a BBQ night aboard or ashore on a beach somewhere; it’s up to the guests. MATINA is a great family boat, maintained in mint condition with a lot of space for many people. Sports equipment includes jet ski, bbq, a tow raft, bananas, Stand up Paddle board, two kayaks, tow toys, waterskiis for all ages; many children have learned to ski aboard, because they have a starter ski kit that’s stable and the crew have done a lot of charters with ten year olds. The tender has a 70 hp outboard. The yacht has broad deck space for sunbathing and she is stable and smooth at sea and offers good sailing performance. 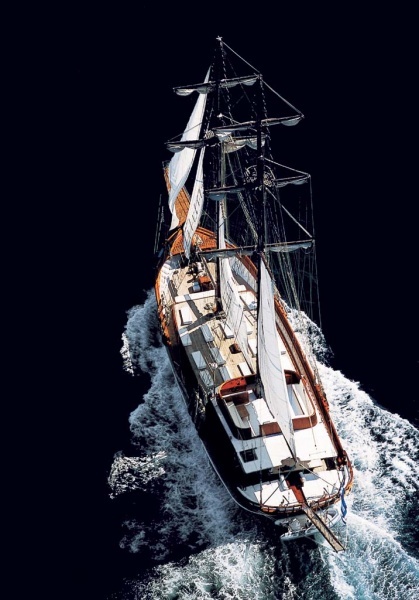 Available in the East Med for Euros 37,800 a week plus 12% VAT + 30% APA from Athens. She can pick up anywhere with delivery fee.